What are "Near Earth Asteroids"? "Near Earth Asteroids" are asteroids whose orbits either cross Earth's orbit around the Sun or approach Earth's orbit. There are about 200,000 Near Earth Asteroids of size 100 meters diameter and larger. Millions of other asteroids are in distant orbits in The Asteroid Belt between Mars and Jupiter, but these asteroids are too far away and not economically attractive in a near term program. We are only interested in asteroids "Near" Earth. 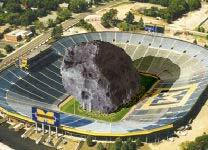 An asteroid that's only 100 meters wide (as wide as a football field) is about 3 million tons of material. (That's 100 meters wide, long, and tall.) Such a "floating mountain" has the mass of 100,000 Shuttle payloads, i.e., about two million tons. We know today of much larger Near Earth Asteroids -- kilometers wide and trillions of tons. The bigger ones have been known for many decades, but modern electronic telescopes are detecting asteroids smaller than 100 meters, which still have far more than enough material for space industrialization and settlement. We would not bring a sizeable asteroid back to Earth orbit anytime soon, unless it were a very small asteroid (e.g., a few meters to tens of meters in diameter). Instead, we would scoop up material from the asteroid, refine it a little on-site, package the better grade material, and return these payloads to Earth orbit. We would be capable of returning only a fraction of a sizeable asteroid in a near term program. The energy required to retrieve and insert these payloads into orbit around Earth is very small compared to other space transportation operations. Of course, this is why we are interested in them -- savings in transportation costs, and the ability to get a whole lot more material into near-Earth space. In layman-like and loose economic terms, engineering plans have been composed which show that a 100 ton spacecraft of relatively simple design could return 10,000 tons or more of asteroidal material to Earth orbit. After the first asteroid is captured, the cost of getting additional asteroidal material is dramatically reduced by reusing this equipment. In more technical terms, and at the risk of losing the non- technical people in this one sentence, the asteroid 1982DB requires a "delta-v" as little as 0.1 km/sec = 360 km/hour, or around 220 miles per hour. For comparison, getting off Earth to low Earth orbit requires a delta-v of about 9.5 km/sec = 34,000 km/hour or 21,000 miles per hour. To get into higher Earth orbit, it's even higher. To get off the moon and into Earth orbit requires a delta-v around 2.5 km/sec = 9000 km/hour = 5600 miles per hour. The energy expended is somewhat proportional to the square of this number, i.e., the number multiplied by itself, which means the differences are even greater as regards energy. When you add in the cost and risks of lifting up against Earth's or the Moon's gravity, including fuel for later in the flight and the vehicle itself, you get a good idea of the benefits of asteroidal material. Further, getting asteroidal materials is not risky business, like launching materials up from Earth or the Moon. Transporting asteroidal material is all "interorbital" -- no risks of crashes, no huge rockets. The gravity of the asteroids is negligible. A person can jump off any but the largest asteroids with leg power alone. More efficient, low thrust propellants can be used. We don't need explosive chemical rockets. What do asteroids consist of? Asteroidal resources are unique and diverse. In general, they are different from the dirt beneath our feet and the ores that we mine from our planet's crust. Likewise, they are much different than the Moon, Mars, and other planets' crusts. Asteroids are much more metal-rich, like the core of the Earth, Moon, Mars and any other planet, and unlike their crusts. The asteroids are normally not as enriched in oxides, silicates, and the other lighterweight elements that floated up to dominate a planetary crust. Many asteroids are like a mixture of a planetary metal core plus a crust plus the mantle in between. Some are entirely like a core or a mantle or a crust, having come from a large parent body which was broken up. In most asteroids, free metal is abundant in the mix, and often dominant. This free metal can be separated by simple magnets, and used without further chemical processing. Notably, asteroids are rich in precious and "strategic" metals such as cobalt and the platinum group. This is because these metals on Earth are mostly in the inaccessible core, being that they don't readily bind with oxygen or silicon and float to the crust during planet formation. There are a great variety of asteroids, so we can't overgeneralize, but we know what is a common kind of asteroid and can determine generally what equipment would be best for processing a fairly desirable asteroid near Earth. Our chosen asteroid consists of a mixture of metal and "dirt". The metal is usually sand-sized metal granules of nickel-iron metal, though big blobs also exist. There are also various "volatile" elements such as hydrogen, water, and carbon, bonded or "frozen" to the minerals under the surface. The metal granules can easily be separated from the dirt using only magnets and soft grinders. The rest is then fed through a solar oven (using lightweight foil mirrors), which cooks out the hydrogen, water, carbon, and other "volatiles". These volatiles are in turn refrozen (no need for refrigeration -- just a shadow will do it in space) and stored as ices for transport. Some of the latter could be used for fuel (e.g., hydrogen, oxygen, carbon) to transport the ore back to earth orbit for further processing. The above is a very simple system to send to the asteroid. No advanced technology, so to speak. This isn't Star Wars -- the asteroids aren't against us. Asteroids are pacifists. It's really pretty simple stuff. And even though asteroids have practically no gravity, the engineering factors that go into "docking" with an asteroid are not too difficult. In fact, we can easily unfold huge solar furnaces without concern over the asteroid's gravity, unlike building things on planetary surfaces. Don't underestimate human ingenuity once we analyze and naturally select methods. There are many kinds of alternative schemes out there for processing asteroidal material, including schemes to process those asteroids known to be one pure metal chunk, and those known to be comets captured by the inner solar system and thus volatile rich in their subsurface. In any case, our return payload can be of substantial quality -- free metal and blocks of ices -- using very little outbound processing equipment. If an asteroid is sufficiently small, the whole thing can be brought back, wrapped in a big bag so as not to pollute any area with floating dirt. Practically all of today�s near-Earth asteroids were not always near Earth. The vast majority came from further out, and fell inward due to collisions or gravitational perturbances, and were captured in the inner solar system by close gravitational encounters with one or more inner planets. The composition of a particular near-Earth asteroid will depend upon its origin, but all asteroids will be useful in at least one way in the early years of space development. Almost all asteroids will have some free metal. Predominantly a nickel-iron-cobalt alloy, it is quite useful as construction metal as-is -- without any need for further industrial processing, besides solar oven casting, sintering, or other forming and industrial means. Excess dirt and slag makes good shielding against space radiation (and offensive enemies, if any). It can also be melted in high temperature solar ovens and turned into ceramic-like things like sinks, pipes, beams, and walls, i.e., structures and outfittings. Of course, the dirt can be used to grow things, using "processed air" easily obtained from the asteroidal material. With 24-hour noontime sunlight, lots of moisture, and no pests, space pioneers will enjoy nice, green living quarters. Oxygen is easily extracted from dirt, and is abundant everywhere. As for the fuel propellant required to get around, it is notable that the most popular fuel, used on things like the Space Shuttle and for the Apollo Program rockets, is plain old hydrogen. You burn it with oxygen in rockets. It's made from plain old water, split apart to make pure hydrogen and pure oxygen, and recombining them makes water vapor which is expelled as fiery exhaust. Water is expected to be plentiful in many asteroids. In addition to indigenous water, hydrogen makes up about 98% of the sun, and the sun emits a constant "solar wind" of hydrogen atoms which have been depositing and collecting on asteroids' surfaces for eons. As for oxygen, it's also one of the most abundant elements, making up about 30% of the mass of common asteroids. Oxygen bonds with most everything -- dirt is mostly oxygen. (For example, the crustal dirt of the Earth and Moon are both about 45% oxygen, mostly in the form of silicates -- silicon oxides � and metal oxides), and Earth's mantle is about 30% oxygen, though the core has relatively little oxygen.) In short, getting fuel is not a problem. It's easily cooked out by a simple solar oven, and liquified or frozen solid by simple shadows in space. Once in the pipes, it's in the pocket. In fact, fuel propellant may be the first thing to be sold in Earth orbit. It's cheap to make from asteroidal material and will be in great excess. Carbon is also common, and hydrocarbon fuels offer some advantages. Notably, unlike the Space Shuttle and Apollo, practically all of the transportation of asteroidal material and other things in space is "interorbital". You don't need heavy duty high thrust rockets. Simple, small, low thrust rockets of extremely high reliability are quite sufficient, and they are more reliable and reusable. Plus they're no-risk -- if they fail, there's no crashing in interorbital space. You just fix any problem as you float safely, then turn the engines back on. The strategic and precious metals -- platinum, cobalt, iridium, and others -- can be separated from the free nickel-iron metal using a relatively very simple thermochemical "Carbonyl" process that's been in commercial use for decades at the huge mine in Sudbury, Ontario, Canada, a prehistoric asteroid impact site which also produces half the world's nickel, nickel being extremely abundant in asteroids, and also produces platinum group metals. The carbonyl process is very simple, and separates iron, nickel, cobalt, and the platinum group metals very nicely. Asteroidal material can be retrieved into Earth orbit at relatively very low transportation cost. Asteroidal material by its very nature is quite useful and valuable. Asteroidal material is relatively easy to process in space. The rest of this chapter goes into details on the above scenario.